You could say this whole challenge has been an exercise in playing what is dealt, but this time, I actually tempted fate. For round thirteen, I asked fate to tell me what to read, and it obliged. A few weeks ago David drew fate out of the caterpillar. The next morning, I went about my day as usual, waiting for the first mention of a book. David and Eva left for school and work, and after a fifteen-minute lie down, I did the breakfast dishes and cleaned the kitchen. (My life is glamorous. You have to admit.) As usual, I opened Instacast and started up a podcast to keep me company. That morning, I decided to catch the tail end of an episode of The Functional Nerds that I had started the night before. So, I looked up the first graphic novel in the Dresden universe and tracked it down at the library branch nearest my house. I picked it up on the way to work the next day and finished it the day after that. I was lucky again. A short read had landed in my lap, so I had hope of finishing my challenge on time. Unfortunately, I didn’t enjoy this one as much as I’d hoped I would. Welcome to the Jungle by Jim Butcher is a fast read which serves to introduce other graphic novels in the Dresden universe. The artwork tugged me in right away, and I enjoyed the setting. 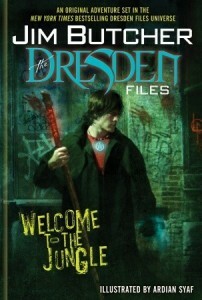 Harry Dresden is a wizard P.I., and in this story, he’s called to help solve a murder at Lincoln Park Zoo. I honeymooned at a zoo (yes, really, and at Legoland), so the story had me from the start on that count. (A soulful but misunderstood gorilla will get me every time.) Harry Dresden made me laugh too, which I appreciate. On the whole, though, I didn’t feel this one. I’ve read several graphic novels, although I’m relatively new to them, so perhaps I don’t have enough experience to know what I’m talking about. It bothers me, though, that Harry Dresden constantly narrates what’s happening on page even as the illustrations are showing us the same thing. I haven’t read the Dresden character in novel form, but I assume he usually narrates directly to the reader like this. I bet it works well in prose, but it felt redundant to me in a graphic novel. It kept me distant from his character by wasting space. One of the hard parts of this challenge has been being honest with my opinions. As a writer, even an unpublished and unknown one, I don’t like to be openly critical of other writers’ work. Criticism is necessary, of course, but as a fellow writer, I feel it is a stab in the back, even if what I’m saying is more like a poke on the shoulder. Yet for the purposes of this challenge, I’ve told myself to be honest but diplomatic. In the future, I doubt I’ll blog much about books I don’t adore in some way, but I couldn’t find a way through this Year of Reading (and blogging) at Your Mercy that didn’t involve writing something critical. I will hope for no hard feelings if by some wild chance Jim Butcher reads this post one day. (I feel silly just typing that.) He’s earned plenty of padding in the form of adoring fans. Trust me. I work at a library. He is a loved man. Speaking of the library. Next up, I got to ask my coworkers! And I’ll post about it tomorrow. *Patrick actually mentioned The Game of Thrones graphic novel first, but for the purposes of the challenge, I decided to count that one as already read. I’ve read the novel and watched the series so recently that even though the graphic novel is a new adaptation, I think it would feel like a re-read. I do want to read the graphic novel, though. It is gorgeous. I checked Welcome to the Jungle out from the Knox County Public Library.